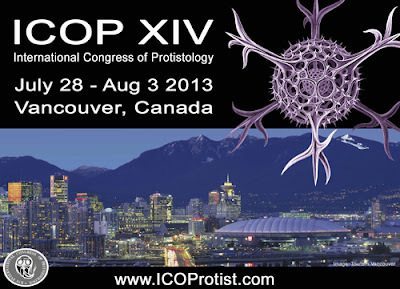 The International Congress of Protistology (ICOP) takes place every four years, and so the 14th ICOP takes place from the 28th of July to the 2nd of August in Vancouver, Canada. Most single-celled parasites infecting humans are known as 'protozoa', but Blastocystis does not belong to this group of organisms; meanwhile, protists comprise both protozoa along with a multitude of other very diverse species, including the Stramenopiles, to which Blastocystis belong. Protists include both uni- and multi-cellular eukaryotic organisms and are distinguished from animals, fungi and plants by a simpler cellular organisation. The conference abstract book can be downloaded here, and presents a perplexing multitude of very interesting and diverse abstracts. There are four abstracts on Blastocystis alone, and two of them are presented by Dr Roger's group in Halifax, Canada + their international colleagues. Alison Jacob, Graham Clark, and I contribute with an abstract on comparative analyses of 8 mitochondrion-like organelle (MLO) genomes from 5 subtypes. Contrary to the nuclear genomes, there is complete synteny and homology between the subtypes at MLO level, although the sequences diverge by up to 25%. Tamalee Roberts and colleagues present data from analysis of 438 samples from a staggering 38 species in Australia. They found Blastocystis in 18 species, including kangaroos, wallaroos, snow leopard, and ostrich, and obtained subtype data from a total 80 samples. The genetic universe of Entamoeba is expanding quickly in these years. Silberman and colleagues (Arkansas, USA) provide data from analysis of Entamoeba from insects such as honeybees, cranefly larvae and multiple cockroach and beetle species. There is no information on any pathogenic properties of insect-infecting Entamoeba however. The abstract book is also a place to learn that marine diatoms are responsible for about one-fifth of global photosynthesis (Armbrust, Seattle, USA) and that photosynthetic marine algae are responsible for 50% of global CO2 uptake (Worden, Moss Landing, USA). There is quite a few abstracts on protist diversity and how NGS tools allow us to study this in a more comprehensive and exhaustive way and the need for taxonomic standardisation. Protist-barcoding includes metabarcoding (de Vargas, Roscoff, France) and some of the taxonomic challenges related to this are presented by Dr Pawlowski, Geneva, Switzerland. Similar to Blastocystis, the trypanosomatids (Trypanosoma and Leishmania) cannot be classified according to morphology and host range, hence, molecular markers are warranted, and there's an abstract by Maslov (California, USA) on the general applicability of 'alternative barcoding', namely the use of Spliced Leader (SL) RNA gene repeats. There is quite a few abstracts on 'rare ciliates' in harsh environments, and I bring your attention also to a previous blog post on extremophilic eukaryotes. We also learn that free-living protozoa can tell us more about the origins of anaerobic parasites (Simpson, Halifax, Canada). And there is a group setting up a Plasmodium life cycle to study the metabolic steps critical to the malaria life cycle (McFadden, Melbourne, Australia). One could go on and on, - why don't you have a look inside the abstract book yourself?! Incidentally, Dr Tai from Vancouver, Canada, promts us to help protists getting into pop culture by wearing t-shirts silkscreened by hand using Ernst Haeckel's diagrams of phytoplankton and light micrographs of parabasalids! Don't know exactly how to get hold of these, but googling 'Ernst Haeckel' and 'phytoplankton' might get you started (go for Google images). For those interested in protists (and art! ), I recommend the blog 'The Ocelloid'.